Warren Area High School senior Lydia Latimer (center) is flanked in this November photo by her father, Greg and mother, Dede, as she signs her National Letter of Intent to play volleyball at Division I Cleveland State. In the back are coaches Randy Gillotti, Sue Baldensperger and Mike Dolan. The path to becoming a college athlete is a little different for everyone. It seems hard to believe now, but when she was younger, Warren Area High School senior Lydia Latimer wasn’t even sure if she was going to play volleyball in high school. 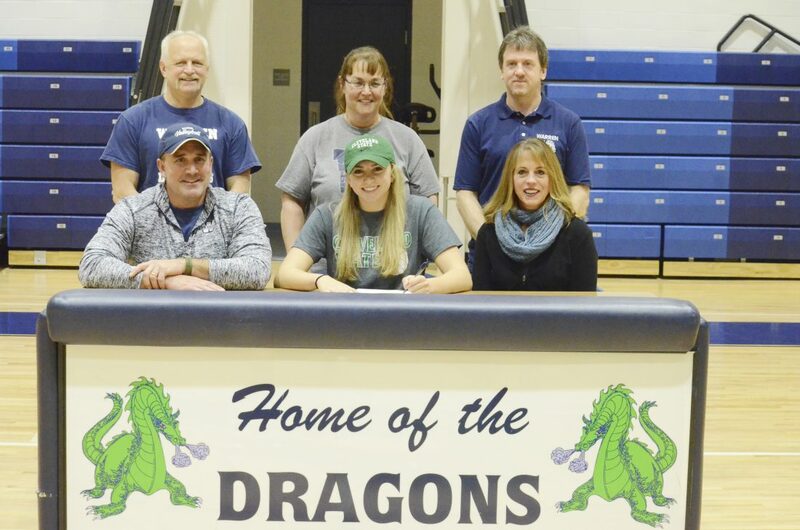 Fast forward to 2018 and she emerged as one of the best players in Pennsylvania, helping lead the Dragons to the PIAA finals and along the way earned a Division I scholarship to Cleveland State University. That’s about the time she also came to the realization that playing volleyball was something she wanted to do beyond high school. 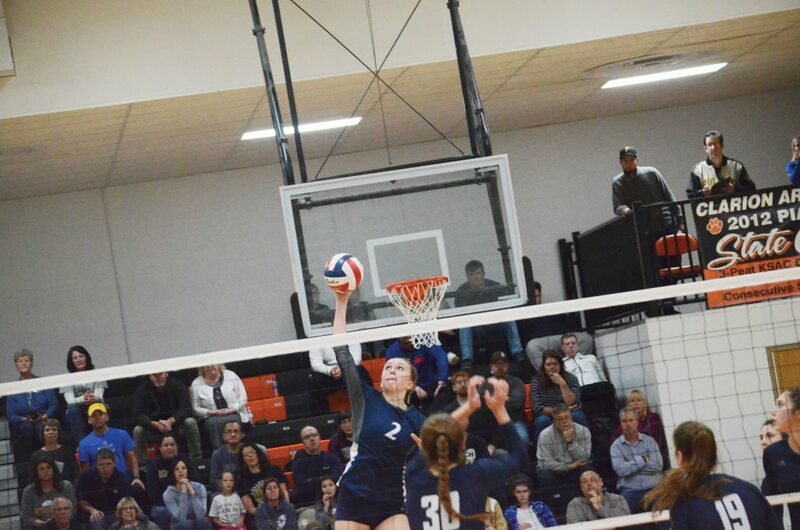 Warren Area High School senior Lydia Latimer goes up for a kill during the Dragons’ PIAA semifinal match against Knoch at Clarion High School in November. “When I was a sophomore and going into my junior year, I realized I could play in college,” she said. She’ll leave Warren as the most decorated player in program history, having set both the single-season (428) and career mark for kills (991), as well as blocks. Of course, for both Latimer individually and for the Dragons as a team, the 2018 season was about so much more. They took everyone on a fantastic journey to the District 10 title and through the PIAA playoffs, capping the most successful season in the history of the program with a state runner-up finish. Looking back on it now, it’s hard for even Latimer to put it into words. ‘Legendary’ became not only the team slogan but also the status the team achieved. Long before the run through states, Latimer began to attract the attention of college coaches. She did so with an intense work ethic that matched her natural talent. Cleveland State was one of the programs that took notice. A team rich in tradition, the Vikings have made the NCAA Tournament in both 2015 and 2016, a place they look to get back to in the near future under head coach Chuck Voss, who will enter his 20th season at the helm in 2019. For Latimer, the family atmosphere made it a natural fit. And as for her intended course of study? And while she will be trading in the small-town life for the city, she will take with her all of the amazing memories that she made along the way. “Beating Knoch in the state semi-finals and ending their winning streak, winning the first ever D-10 title for Warren volleyball, having an amazing flannel panel, prank-calling Mike (head coach Mike Dolan), all of the fun nights at camps and team sleepovers and bus ride chats,” she said when recalling some of her fondest volleyball memories. And those memories were also made possible by the support of her two biggest fans, her mother, Dede, and her father, Greg, as well as her coaches. And while many people know her for her athletic ability (be sure to catch her for the WAHS track and field team this spring), there is so much more to this talented, driven and kind young woman.